A very unusual animal used to roam Australia. It was like a canine with black stripes. 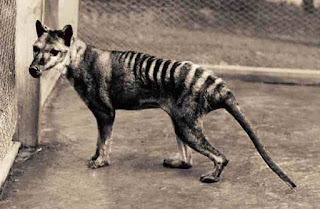 The last Thylacine died in captivity on 7 September 1936. Unfortunately, the last of the species was not recognized as important so little effort was made to record its behavior. A short, grainy film is the only thing that we have of this wonderful creature. No photographs were ever taken of the Tasmanian Tiger in the wild. | __ .. not ..